Join AIA|DC and architectural historian Matthew Gilmore for an exploration of the little-known aspects of Foggy Bottom–a neighborhood that it has witnessed, participated in, and reflects Washington, DC’s unique history and will illustrate the shift from industry and residential to an institutional and entertainment destination. Participants will travel from the Washington’s first Circle to the last remaining early industrial site in the city, through the historic district and alley dwellings, and finally to the transformed Foggy Bottom of the Kennedy Center and Watergate. Notable stops will include St. Mary’s Church, Columbia Plaza, the United States Institute of Peace, Braddock Rock, and more. Photos courtesy of UrbanTurf and Matthew Gilmore. Matthew Gilmore co-wrote Foggy Bottom and the West End in Vintage Images, copies of which will be available on the tour. 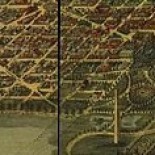 This entry was posted on October 2, 2016 by dchistorystuff in City of Washington, DC History, DC Neighborhoods, Early Washington DC, Early Washington history, Foggy Bottom, Irish Washington, John L. Kidwell, Kidwell Meadows, Manufacture, Morris v United States, Potomac Flats case, Potomac Park, Potomac River, Urban development, Walking tours, Washington Canal, Washington DC, Washington DC canals, Washington DC housing, Washington DC planning, YMCA, Young Men's Christian Association.